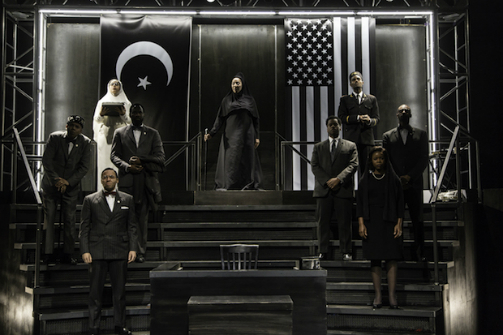 The ensemble of X: Or, Betty Shabazz v. the Nation. Photo by Charles Erickson. BOTTOM LINE: A new play by Marcus Gardley seeks justice for Malcolm X, rigorously defended by his widow Betty Shabazz, in a slick production by the Acting Company. A history lesson in the form of a trial, X: Or, Betty Shabazz v. the Nation reaches far beyond the historically accurate account of the life and death of Malcolm X. In his new play, Marcus Gardley tackles many painful points of modern American society, like the racial divide and gender inequality, in a bio-drama about the controversial revolutionary of the 1960s. Much like in Shakespeare’s Julius Caesar, watching the dangerous games played by people in power leaves you with feelings of horror that you can’t shake off, even long after the show. Betty Shabazz (Roslyn Ruff), the late wife of Malcolm X (Jimonn Cole), assumes the role of prosecutor, accusing the Nation of Islam of assassinating her husband with the passion of a lioness. Malcolm Little joined the religious and political organization in the late 1940s, rapidly rose as a minister and a national spokesman for the organization. He assumed the name X in place of Little, his "slave name." Malcolm X left the Nation in 1964 after falling out with its leader Elijah Muhammad (William Sturdivant), and was assassinated the next year. His former brothers, led by Louis X, better known as Farrakhan (J.D. Mollison), argue that the CIA, FBI, and NYPD are to blame. But although the U.S. government was onto Malcolm, the fifteen bullets that killed him came from the guns of three of his former brothers. Cole is "pulled from the audience" in the beginning of the show to play Malcolm X; after a brief "makeover" and fast-forwarding a few years, we see him preparing a speech on the assassination of President Kennedy. This pivotal point not only mirrors Malcolm's own (future) death, but also represents a moment where his relationship with Elijah Muhammad took a turn. As played by Sturdivant, the hypocrite prophet seems more comical then evil, an interpretation that is out of tune with the rest of Gardley's play. Sturdivant also doubles as a nameless bootblack, a jester/godlike narrator who addresses the audience directly. He pops up here and there, struggling to bring a comedic note to the story, making him seem rather unnecessary, unexplained, and undeveloped. Frankly there is no need for this crutch figure when there are such characters as the Judge (a goddess-like Harriett D. Foy) and Betty Shabazz (the warm yet fearless Roslyn Ruff) to propel the court session/spiritual séance. For the most part, the cast shines brightly in vibrant performances against the austere set by Lee Savage: the solemn black steps host the participants of the trial and serve as various locations for flashbacks. The predominantly grey and black costumes by Candice Donnelly compliment the ascetic scenic design. X is probably the darkest show I have seen lately, both visually and emotionally. There is no single sinister villain in the play, but rather, a ring of jealous, fearful, or misguided individuals closing in around Malcolm X and his wife. Historically accurate yet heartfelt, X tells the universal story of the opposition between a single man and the forces that created him. It is devastating to realize how a person can be used as a tool to deliver somebody else’s philosophy, and then be eliminated once he speaks up against the powerful. X: Or, Betty Shabazz v. the Nation is by Marcus Gardley. Directed by Ian Belknap. Scenic Design by Lee Savage. Costume Design by Candice Donnelly. Lighting Design by Mary Louise GeIger. Sound Design and Original Music by Justin Ellington. Choreography by Byron Easley. The cast is Jimonn Cole, Harriett D. Foy, Kevis Hillocks, Cedric Mays, J.D. Mollison, Austin Purnell, Joshua David Robinson, Roslyn Ruff, William Sturdivant, and Tatiana Wechsler.